The tenth anniversary of Merseyside music tastemakers Getintothis is to be celebrated with a host of attractions at this year's GIT Award. This Saturday, May 13, sees Liverpool music website Getintothis celebrate their tenth anniversary, with a host of celebrations to coincide with this year's edition of the foremost Merseyside music prize, The GIT Award. The website have been running the award for six years, with the main prize awarded to the city's best musical talent, as decided by a panel of judges including tQ's John Doran (who will DJ on the night), Louderthanwar's John Robb, Jeff Barrett of Heavenly Recordings and Rich Walker of 4AD. 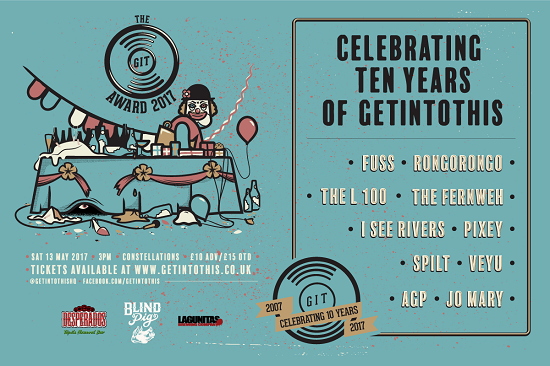 In recognition of the site's tenth anniversary, ten of the city's finest new talents will play as part of a special celebration. They include erratic post-punk maniacs RongoRongo, hotly-tipped psychedelic upstarts The Fernweh and the city's urban forerunners The L 100. A number of the prize's twelve nominees will also play live, while God Colony and Immix Ensemble will present specially commissioned videos. A special performance from one of the event's former winners has also been promised, with details closely under wraps, while Roger Hill returns as host for the second consecutive year. This year's GIT Award Nominees can be read in full here. It was recently announced that Zuzu has been named this year's 'One To Watch' winner. The 'Inspiration' award, in previous years given to the likes of The Hillsborough Justice Collective and the late Alan Wills, founder of acclaimed Merseyside label Deltasonic Records will be announced on the night. The first 500 attendees to arrive will also be treated to the fruits of Getintothis' collaboration with Dead Crafty beers, a special new brew titled Crafty GIT. should you wish to be one of them, you can buy tickets here.